Just How Stupid Is The NYTimes' Threat Letter To Quartz Over Copyright Infringement? Well, well, well. With the NRA planning to blame violent video games and movies, and eager grandstanding politicians, pundits and some members of an angry public ready to do the same, it seems like it might be useful to look at some actual data. Senator Jay Rockefeller -- one of the grandstandingest grandstanders on this particular issue -- has already introduced a bill demanding that the National Academy of Sciences "study the impact of violent video games and other content on children." The speed with which this was introduced suggests that it was already sitting in a desk drawer, just waiting for a tragedy to exploit. But, the thing is, we've got a ton of evidence already. The moral panic crew always claims that there are studies that support their argument that violent video games are bad, but that's not true. Every single study they cite tends to either have serious methodological problems, or to show something other than claimed (such as the fact that immediately after playing a violent video game, gamers may feel slightly more aggressive -- but with no evidence this lasts or leads to violence). A few years ago, a very thorough review of all of the research trying to connect video games to violence showed that there was no real evidence of any real world impact. Instead, what they found was that some studies used "poorly standardized and unreliable measure of aggression" to make their arguments, but that no study had shown any real world impact. Furthermore, in going through all the research, they concluded that "Overall, effects were negligible, and we conclude that media violence generally has little demonstrable effect on aggressive behavior." "Violent video games are like peanut butter," said Christopher J. Ferguson, of Texas A&M International University. "They are harmless for the vast majority of kids but are harmful to a small minority with pre-existing personality or mental health problems." He added that studies have revealed that violent games have not created a generation of problem youngsters. "Recent research has shown that as video games have become more popular, children in the United States and Europe are having fewer behavior problems, are less violent and score better on standardized tests," Ferguson, a guest editor for the journal, explained. That same study also showed that much of the research shows that video games can actually be quite useful to children. 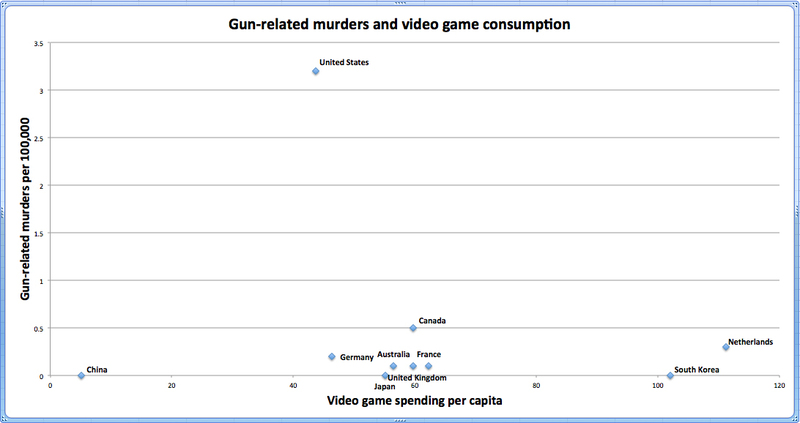 Finally, the Washington Post recently published a Ten-country comparison of video game spending to gun-related murders. Let me know if you can spot the outlier. This, of course, is correlation data, and while correlation does not equal causation, a lack of correlation certainly suggests that there is no causal impact here. If anything, the chart suggests, pretty clearly, that there's an entirely different variable impacting the US's proclivity towards gun-related murders, and that video games have absolutely nothing to do with any of it. "How many Mormons go on rampages and kill anything that is moving?" Is this sarcasm or are you seriously that ignorant?